Yaba addiction in Bangladesh is now a big problem. High to low or rich to poor, all families are having trouble with their child for the massive Yaba addiction in Bangladesh. The stretch of Yaba has increased alarmingly in recent years. The drug dealers are scattering its market by creating new Yaba user. In the last eight years, the Yaba has stretched out by 9149.5 percent. In addition, compared to the 2014, the number of Yaba user has spread by 211.22 percent in 2015. In the last year, various law enforcing agencies have seized 2 crores of Yaba from various parts of the country. Narcotics Control Department (DNC) has revealed the information in its annual report. 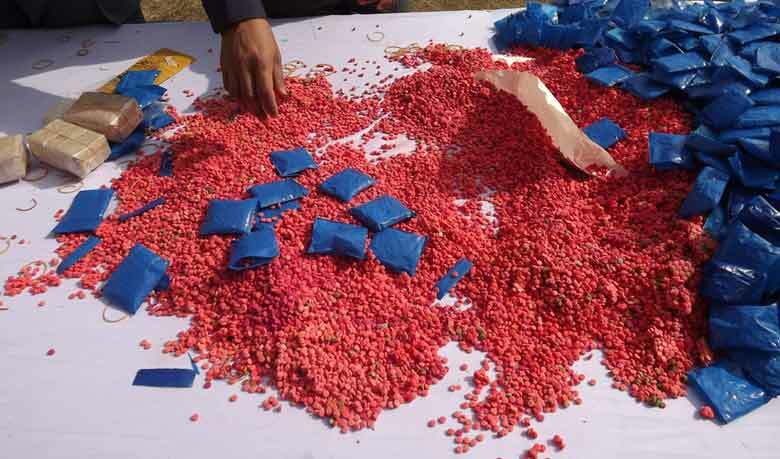 According to the report, the highest numbers of Yaba being seized in Chittagong which is 91 percent of total seizure. The numbers of cases filed in the various police stations in Chittagong are also highest 37.6 percent compared to the other parts of the country. The consignments of Yaba have been inflowing in the country through 10 kilometers of Myanmar boarder. By crossing Naf River, Yaba being smuggled through 15 river and road routes. Relevant sources said, hundreds of thousands consignments of Yaba are entering the country by sea. These consignments are reaching Chittagong over Teknaf, Cox’s Bazar and Ukhia. Some consignments also smuggled by Saint Martin's and Sharpari Island. On the other hand, after Chittagong, capital Dhaka is the second largest market of Yaba consignment. According to the United Nations Office on Drugs and Crime (UNODC) sources, the total amount of drugs seized worldwide is only 10 percent of the total trade product. With that calculation, in the last year, almost 18 crores of Yaba being changed hand in the country. When asked, director of DNC (operation and intelligence) Toufiq Uddin Ahmed said, we are working with zero tolerance against Yaba and conducting operation immediately after getting any information in this regard. Assistant director of RAB Mizanur Rahman said, to arrest Yaba traders we are conducting operation regularly. In the last year, we detained 50 lakh 19 thousand 450 pieces of Yaba where 56 lakh 22 thousand 206 pieces in last six months. Yaba are entering through 15 routes: According to the DNC report, Yaba are inflowing in Bangladesh from Myanmar through 15 routes. The routes are 1. Anahuk Minhalut Jhaliapar-Saint Martin’s-Shaharpari Island; 2. Al La Kiao Jariapara-Dhikhinpara-Saint Martin’s; 3. Jawamdad Dhokhinpara Jaliapara-Shaharpara Dip-Kanaichang-Mangdu-Nayangayang-Teknaf; 4. Sabrang-Dhokhinpara-Jjalaiapara-Shaharparir Dip; 5, Moder Kalaya Damdamia-Jadipara-Cox’s Bazar Highway-Teknaf-Shaharparir Dip; 6. Dokhin Nila-Chatapara-Ledapara-Damdamia; 7. Kayamruk Noapara-Hoykiang-Cox’s Bazar Highway-Tambru; 8. Tambru-Tayunbru-Ukhia-Gandum-Balukhalu Bazar-Tambru (BD)-Hoykoang-Noapara-Ukhia; 9. Tambru (Bam)-Dekubunia-Mongdu-Katapahar-Bakukhali-Baysfari-Ukhia; 10. Tambru (Bam)-Dekubunia-Mongdu-Awkhiab Old Pan Bazar-Babulkhali-Ukhia; 11. Tambru (Bam)-Fakirapara Mongdu-Jalpaitali-Gandum-Naykhangchori-Bandarban; 12. Tambru (Bam)-Dekubunia-Mongdu-Tambru West-Naykhangchori-Bandarban; 13. Dekubunia-Mongdu-Awkhiab-Dalarmukh-Palangkhali-Ukhia; 14. Mongdu-Awkhiab-Damdamia Chekpost, Teknaf-Cox’s Bazar Link Road and 15. Mongdu-Akhiab Baddar Mokam-Jadimara Jelaypara Slwisgate-Damdamia-Hoaykong Checkpost-Cox’s Bazar.